I know that it is still summer here in Germany but we are currently experiencing cold wind and rain showers. Instead of going outside, all I want to do is stay at home and enjoy a warm meal. In the Philippines, we usually eat champorado, arrozcaldo or lugaw (plain congee) especially during rainy season. We also love side dishes and condiments! Champorado is usually eaten with dried fish, while arrozcaldo and lugaw are incomplete without tokwa’t baboy (beancurd and pork). Soy sauce, fish sauce, vinegar, or Lemon juice are also used as condiments to make it more flavorful. Now, I’ve cooked a healthy meal which taste like lugaw with a twist. Pour water in the pot. You can also include the chopped garlic, onion, and ginger for more flavor. When it boils, put the oats and continue cooking for 15 minutes. Add salt and pepper to taste. 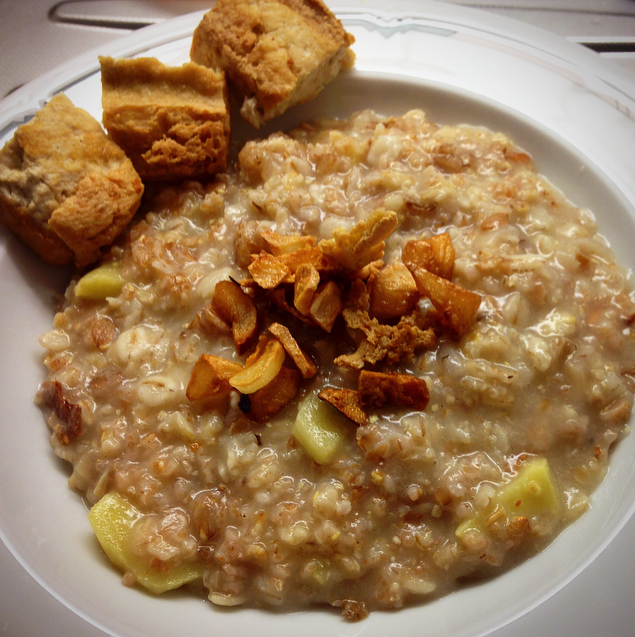 It depends on your preference, if you want to put more water so that the consistency of the porridge can be thinner. For garnishing, put fried garlic and tofu on top.